[Waits for applause to die down] Just a short ten months ago, amid chaos and disorder, a dream was born. Like many dreams before it, this dream suffered the scorn, ridicule and open disdain of those who did not understand it. This dream, this idea, was unusual in its very nature. Odd in its construction. Weird in its breadth. Indeed, it could be said, that this idea was simply crazy. For why should it? The forces arrayed against this concept were vast, well established and notorious. The weight of history, of serious business, was enormous. How dare one man even conceive of such an audacious joke and expect it to thrive amongst such powerful forces? It must surely fail. As I stand here this evening, I am pleased to report that such failure was not an option. That this crazy idea has not only worked, but that it has exceeded far beyond what even the most optimistic dreamer could have imagined. Stay Frosty is real. It exists. It thrives. And as we pass into only our tenth month of operations, Stay Frosty continues to expand, grow and influence events from a slightly skewed and dangerous perspective. As we enter our tenth month we are knocking on the door of two-hundred pilots. We have successfully finished one of the most complicated, audacious and bold events in all of New Eden. And we stand on the brink of our first major tournament participation. Our pilots stride the space lanes from Immensea to Curse, from Providence to Heimatar, from the New Eden Gate to the cold expanses of the North. They are ambassadors of Solo and Small Gang warfare, soldiers of freedom, and destroyers of Empirical chains. They pursue honorable combat while laughing at fear and engage anything with a reckless nature. Stay Frosty has pulled within itself the young, the veteran, the famous, the new, the challengers, the wanders, the seekers, the embattled, the inactive, the mature, the inexperienced, the great and the weary. All of whom, no matter their background, share one over-reaching principle - the desire to have fun. Do we continue to face challenges? Of course we do. Perhaps the biggest of these remains the forces that constantly pull us towards normalcy. That expect us to behave as others do, that want us to 'grow up' and become just like them. These are powerful desires, inherent in a system much older than us. Constantly begging from the sidelines, do as we do. Behave the way we do. Become us. To those forces I say emphatically and without hesitation - Nuts! 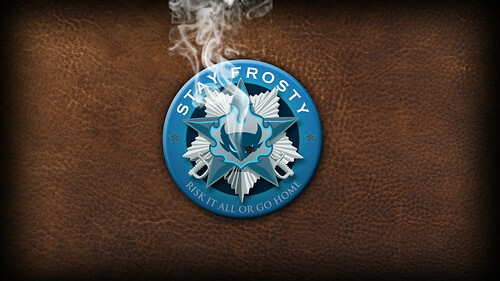 Stay Frosty was not built to become just another corporation. Just another cog in the machine of your expectations. We will not succumb to your desires, we shall continue to live our own. You may not understand us, you may even look down on us, but you will not be able to ignore us. And we have bigger plans yet still to achieve. Bigger goals remain to be accomplished and overcome. We are, in so many ways, still getting started. Still building, organizing, and molding a cohesive whole from so many disparate pieces. We may stumble, we may often trip over ourselves, but we move forward knowing that the end does in fact, justify the means. We are the men and women of Stay Frosty. We have no bubblegum. But we do have cookies!